EMMANDUS INSPIRATIONAL NETWORK! : Be intentional! Have you ever met someone, or walked away from a meeting that made your life richer? That was how I felt at my meeting with the Queen of Talk in her office yesterday. 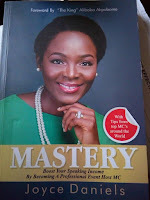 I attended her instagram live Class on Monday, where she had been impressed at how I typed out her talk points, so she decided to gift me a copy of her fast selling book, "MASTERY: Boost Your Speaking Income By Becoming A Professional Event Host MC"
@iamjoycedaniels (Joyce Daniels) is the Quintessential Master of Ceremonies that brings your events alive and one of the most sought-after MCs in Nigeria hosting a long list of high-profile events. She's the founder of TALKADEMY -Africa's Premiere Training School for Masters of Ceremonies and also a Senior Trainer at Dale Carnegie Training Nigeria. Joyce has this amazing personality and smiles that emits all positivity and blessedness. I was also privileged to present her with copies of my book, BRIGHT IDEAS. I can't wait to finish reading her book, and apply everything in it to scale up my Speaking Income! Look forward to the book review soon. For information on ordering copies of her new book "MASTERY: Boost Your Speaking Income By Becoming a Professional Event Host MC"